Up-cycling of old cardboard boxes and materials is quickly becoming an important business operations tool for small, medium and enterprise-wide businesses. Converting your incoming cardboard into outbound shipping materials is more than eco-friendly, it’s a direct effect on the bottom line of businesses worldwide. Upcycled Cardboard boxes are turned into shipping and packing materials to save small business lots of money year over year. Widely used by industrial businesses, the trend in recycled cardboard into shipping and packing materials is making its way to mom & pop shops and business of all sizes and markets. 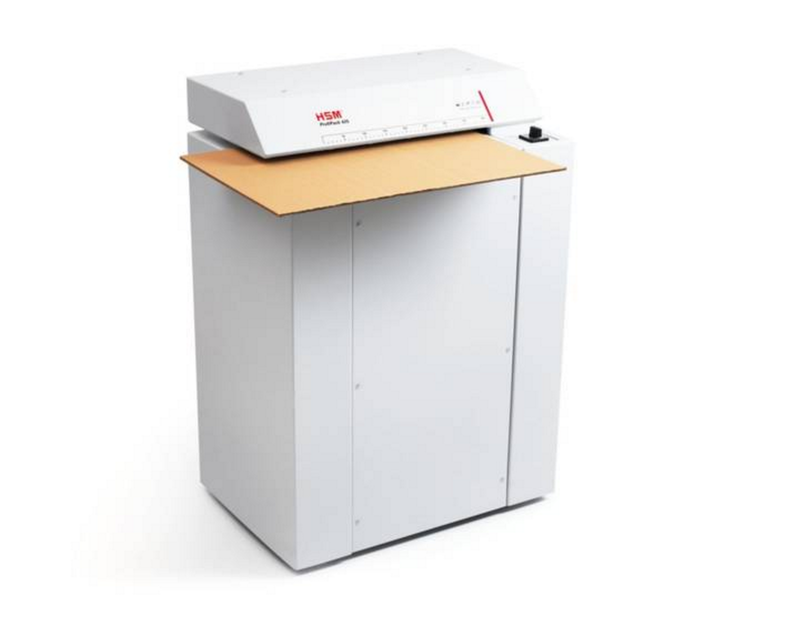 HSM has been touted as the most reliable and best reviewed brand of cardboard shredders and cardboard recycling machines on the market and we are proud to now offer the HSM ProfiPack 400 and HSM ProfiPack 425 cardboard recycle machines. Some businesses utilize HSM Cardboard Shredders & Recycle Machines as Part of ISO 14000 Environmental Management Plans. HSM ProfiPacks are ideal cardboard box solutions for companies seeking to reduce costs and reduce environmental impact by minimizing your need to purchase packing peanuts, bubble wrap or other shipping supplies and materials. 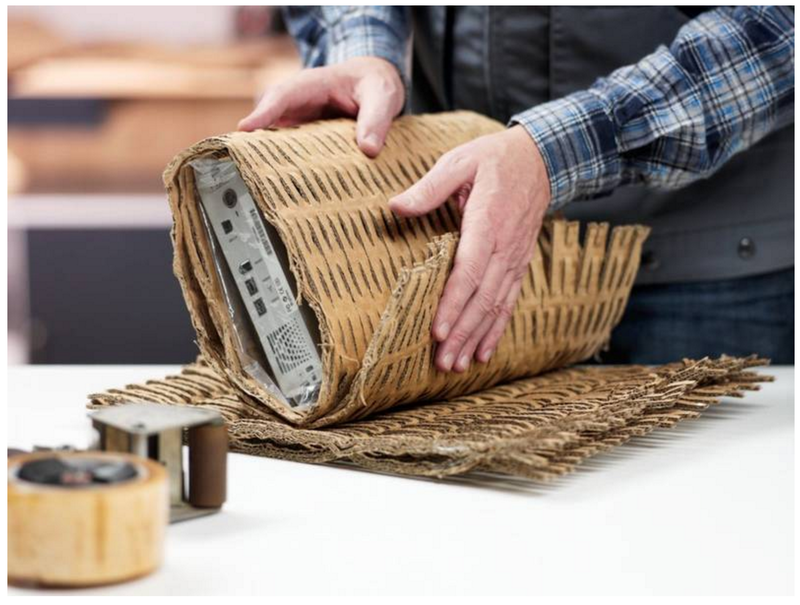 The HSM ProfiPack is one of the best ways to create a cost savings plan that converts & upcycles old cardboard boxes into high quality packing materials for outbound shipments. Whether you are a manufacturer that ships out packages or oversize shipments or simply want to create Eco-friendly packaging as part of your internal environmental initiatives such as ISO 14000 Environment management , ISO 14006:2011, or other non accredited environmental improvement strategies; the HSM carboard recycling machines and shredders are one of the best investments for ROI in the age of business sustainability. Measuring and managing environmental impact is a key metric for many businesses, particularly with certified ISO 14000 or other similar standards for sustainability. By incorporating planned continual improvements for the recycling of cardboard and conversion to packing materials, some companies are realizing benefits that improve operations across multiple areas such as reduced costs, improved sustainability, achieving standards for greenhouse gas accounting, verification and emissions trading, as well as metrics used for measuring the carbon footprint of products that are manufactured. Businesses around the world, as well as their customer and shareholders or stakeholders, are increasingly aware of the need for environmental management, socially responsible manufacturing and shipping of products that all dovetail into long-term sustainable growth and development. When small and large businesses take proactive management of the environmental aspects of product design, shipping materials and cardboard recylcing, there are clear benefits for operational efficiency and bottom line profits. For businesses that are seeking alternative solutions to meet unique requirements or specifications, we also offer fully customized warehouse management systems in the form of Industrial Balers & Recycling Chain Raw Material systems. Whether you are part of a national chain of retail stores or in manufacturing of goods, we are here to help.